I’ve been doing a fair bit of coding in recent weeks and I thought I’d better write a few details down before I forget about them. As previously noted, I’ve been gathering together various historical data sets for a project at the National Museum of Australia. One resource that I was keen on including was the fantastic Australian Newspapers project at the National Library of Australia. What I had in mind was being able to give a sense of context to any historical event by calling up the headlines for that particular time. Unfortunately there’s no API for the newspapers project (or Trove in general), though apparently it’s in the works. So I had to reverse engineer the advanced search page to work out the various query options, and then build a screen scraper to harvest the results. I played around with the search options a bit to fine tune the results, finally deciding to limit them to ‘news’ articles with more than 1000 words. Annoyingly, only 10 results are returned at a time. I had hoped to parse the results as xml, but a rogue <br> tag broke the XHTML, so I fell back on Beautiful Soup – a Python module that makes screen scraping considerably easier by tidying up HTML structures. After than it was pretty straightforward. Soon I had my own Python module to query the newspapers database and process the results. This required me to make a change to the API and Python module so that I could retrieve a random headline. Basically it just meant generating a query based on random values for the day, month, year and state. For the interface I once again delved into JQuery’s box of tricks. With all the kerfuffle about ChatRoulette in the media, the name seemed obvious – Wragge’s Headline Roulette was born. 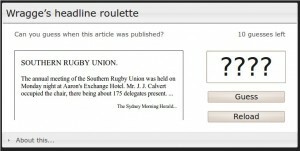 Test your historical nous with Headline Roulette! It’s a very simple little app, but a number of people have said how much fun it is. The bad news is that imminent changes to the NLA newspapers site are probably going to break it (at least in its current form). So enjoy it while you can. When the NLA makes an API available I might work on something a little more sophisticated. Another great benefit of the game is that it actually takes you back to the NLA site. This was actually what happened in my case. A trigger for finally getting me to visit and realise how easy it is to correct the newspaper text!